Venezuela is issuing new higher-value notes to help deal with some of the practical problems of soaring inflation. A backpack full of cash is often required to pay bills at a restaurant or supermarket. The central bank said that six new bills ranging from 500 to 20,000 bolivars would come into circulation on 15 December. Currently the largest note is 100 bolivars and worth about two US cents. Over the past month, the currency has tumbled by 60% against the dollar on the black market. "[This] will make the payments system more efficient, facilitate commercial transactions and minimize the costs of production, replacement and transfer ... which will translate into benefits for banking, trade and the general population," the central bank said. What is behind the crisis in Venezuela? The dearest Nutella in the world? 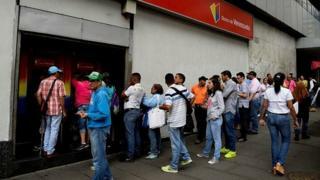 On Friday, Venezuela's credit card and cash machine system froze, leaving businesses unable to process transactions and having to ask for cash or to delay payment. Socialist President Nicolas Maduro blamed the problem on a cyber-attack. He maintains that the economic crisis is being backed by the US. The government last published figures for inflation in December 2015, putting it at 180%, but the International Monetary Fund (IMF) estimates that next year's prices will rise by more than 2,000%. The Venezuelan economy has been hit hard by the fall in the price of oil, its main source of income. It also has had strict currency controls in place since 2003. Venezuela: The most expensive Nutella in the world?